Quickie survey about Mayo products- help please! Just a quick survey in the link below about Hellmans products. Hellman have actually done a lot over the years to change their packaging to help you get the last bits of mayonnaise out. Interestingly, this hasn’t meant that they sell less mayonnaise, because we all find it easier to get more out of a jar. Sales actually increased nearly 10% in the UK as a result, and crucially, the wasted leftovers in the bottles dropped dramatically. 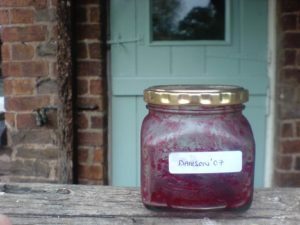 You can see the old problem in the picture – clearly not mayonnaise but homemade damson jam from the garden. This is the picture before it was licked clean. That’s all just interesting facts, the survey is on the link below. Click and share to win some mayo!